1.To ensure continued operations and a stable home environment for young people. 2.To provide the highest quality care possible for young people including citizenship and belonging in the community. 4.To reduce staff turn-over, ensure longevity of employees, through recognising the difficult task of caring for children with complex needs. This ensures continuity of care and stable care figures in young people’s lives throughout their stay with Pathways Ireland. 5.To promote positive healthy life choices and positive outcomes for young people in our care through acknowledging the research regarding past failures and working hard to ensure they are not repeated. 6.To promote positive healthy relationships in which young people can learn to trust and start to heal. 7.To help young people reach their potential through creating a nurturing environment and trusting relationships in which they feel: empowered, listened to, valued, valuable, loved, loving and loveable. 8.To provide a place of safety and fun for young people so they can be afforded the same enjoyment of childhood as other children. To ensure continued operations and a stable home environment for young people. To provide the highest quality care possible for young people including citizenship and belonging in the community. To promote positive healthy relationships in which young people can learn to trust and start to heal. To deliver in-house education as a primary source of education to young people. To help young people reach their potential through creating a nurturing environment and trusting relationships in which they feel: empowered, listened to, valued, valuable, loved, loving and loveable. To reduce staff turn-over, ensure longevity of employees, through recognizing the difficult task of caring for children with complex needs. This ensures continuity of care and stable care figures in young people’s lives throughout their stay with Pathways Ireland. •An adaptation of the Focus Ireland Competency Framework. (Governing Professional Practice and Working Together). •Cornell University Therapeutic Crisis Intervention (TCI) governing communicating and relationships with young people as well as planning for helping promote positive healthy behaviour that will serve them into adulthood. •Various authors (found in further reading) regarding ‘mistakes from the past’ regarding relationships with young people. •Winnicott, Ward et al: Regarding providing emotional availability and a nurturing environment. The personal difficulty that can be experienced in “The Therapeutic Task”. What theories below are applicable? Winnicott, Ward et al: Regarding providing emotional availability and a nurturing environment. The personal difficulty that can be experienced in “The Therapeutic Task”. •Commitment to providing the highest levels of quality service: Always promoting the good name of the organisation; always abiding by company policies and procedures. •Openness to change and contributing to an environment that encourages constructive challenging of both our colleagues and ourselves. •Informed practice and on-going training and professional development. •Effective communication both oral and aural & actively listening. •Commitment to health & safety, and to the overall protection and well-being of individuals. •Analysis, Evaluation and Problem Solving. •High competency and knowledge in report writing, file keeping and overall pride in how the unit and care of children is presented through record keeping. •In simple language you must always strive to provide the best service capable whilst always looking to evaluate and improve on areas identified as lacking. You can do this through identifying it yourself, through client feedback, supervision, coaching sessions, peer feedback, internal audits and other agencies. The key is to remain open to change and development. •Own Practice: You assess how well you carry out your work activities; you identify how your values, belief systems and experiences may affect your work with individuals and you identify any skills, knowledge and support that would help you to carry out your work practice more effectively. •Always Behave in a Professional Manner: You must always work off plans (made collaboratively with the client). You should always try to be positive and solution focused. You must take responsibility for your own work and mistakes and remain self-motivated. A productive attitude does not convey… “It’s hopeless, or it’s the clients fault or another agency”. There is always a solution to every problem. And if at first you don’t succeed…..
​Look for areas to point out, criticise and complain about.areas to delegate work, change errors in others work, to ensure you leave work on time.ways to improve yourself through; client feedback, supervision, internal audits and other agencies. Openness to changebonusesperfection and contributing to an environment that encourages constructive challenging of both our colleagues and ourselves. Commitment to providing the highest levels of quality service: Always promoting the good name of the organization;manager;client; always abiding by the law.company policies and procedures.your gut instinct. • This relates to your day to day interactions and commitment to building and maintaining relationships between self, team members and external agencies, upon which we depend to help our clients achieve their goals. The attitudes of workers are of great importance in order to maintain a strong team and positive relationships with the community on behalf of the organisation. This is vital when advocating on behalf of your client. •Respect for clients, each other, and other agency workers. •Leadership: The ability to lead and be led. •Influencing and negotiating in order to achieve solutions and positive outcomes. •Effective team working, providing and receiving support from each other. •Developing and maintaining good external relationships. What are those key points again? Respect for clients, each other, and other agency workers. Developing and maintaining good external relationships. The expectation of Pathways Ireland is that employees will at all times show complete respect for their clients, and behave in ways that empower and encourage the client to become independent. •1. Advocacy: Ensuring you are delivering a service that is meeting the needs of the client as well as empowering clients to effectively use community services available to them. •2. Promoting choice, independence, health and well-being, and respecting the decisions of the client. •5. Contributing to the prevention and management of challenging behaviour. Pathways Ireland employee are valued because they are rare, unique and inimitable. For this reason it is important to focus on the quality of your relationships with young people, and to strive to use the tools available to avoid ‘empathy fatigue’ or ‘burnout’. Social care workers can often be personally hurt by the behaviours of their clients. Deciding to work with a child and to be brave enough to develop a real trusting relationship requires patience and understanding. We need to look beyond the behaviour and help the young person with the unmanageable feelings they are trying to convey. Winnicott 1965 focused on early parental relationships with infants where children are helped by their carers to move from a state of dependency towards independence. He believed ‘the holding environment’ was a crucial aspect in this process. The holding environment is usually provided by the mother, both physically and emotionally, where she holds her child’s powerful feelings until the child is gradually enabled to learn to do this for himself. Bion 1962 spoke about “containment”. Unmanageable feelings and deepest anxieties are “projected” onto the care giver who must feel them for him/her before handing them back in a manageable way. This is the task of the Social Care Worker. Opportunity-led-work is of utmost importance when caring for young people. If a young person begins to talk about difficult feelings or memories, allow them the attention, space and time to do this. It may feel more comfortable to distract or comfort a child rather than to hear or feel their pain. However, this may be the child’s final leap of faith in trusting a adult with their feelings, or could be a ‘test’ for further disclosures. Children referred to us are complex, but have three things in common. One is that they are all victim in some way to the failures of the relationships with the key adults in their lives: relationships that have failed to meet their emotional and developing needs either at key points in their lives or throughout. The second is that they continue in some way to cope with the consequence of their earlier deprivation, loss, separation, trauma or abuse... They affect the young person’s capacities to learn or be taught, to be looked after, to join in normal social activities, make friends, or try to be hopeful about the future. The third is that it can be assumed that they are at some stage of bereavement/grief/loss. Michael Ungar (2012) speaks of the importance of positive role models for building lasting resilience. “(Werner & Smith 2001) followed the lives of nearly 700 multicultural children of plantation workers living in poverty on the Hawaiian island of Kawai. By the age of eighteen about two thirds had done poorly as predicted, with early pregnancy, need for mental health services, or trouble in school or with the law. However, one third of those at-risk had developed into competent, caring and confident young adults with the capacity to “Work well, play well, love well, and expect well”…most often crediting supportive relationships or religious involvement (belonging and community). These findings have important clinical implications, revealing the potential, despite troubled childhood or teen years for later developing resilience across the life course. In short, resilience turns victims into survivors and allows survivors to thrive. Pathways Ireland works towards creating a culture whereby young people are dependent on the high level of care it provides. Pathways Ireland focuses on the following as part of the relationship; advocacy, promoting choice, respecting decisions of clients, and empowering them to be able to go on and lead their own lives in the community. The most valuable tool we have in therapeutic interventions with young people is ourselves. Employees are replaceable and anyone can be easily trained by Pathways to replace another on the team. People who have been hurt or abused will often act out and push or ignore boundaries. Social Care Workers need to be able to let go of past bad experiences and not move them from one relationship to the next. Social Care workers should remain emotionally detached to protect themselves and young people. Challenging behavior is simply a young person acting aggressively either physically or verbally. The 'holding environment' is crucial in helping a young person to move from dependency towards independence. 'Containment' is where a care member takes raw feelings and anxieties from a young person and makes sure they are not presented by them again. If a young person is opening up to you and you feel uncomfortable with this you should use skills of distraction to avoid them verbalizing their pain at that time. Care workers need to provide young people with the opportunities to form relationships that are positive as their future success will depend on this. They also need to use these relationships to challenge their pessimistic assumptions about themselves. Ecological refers to the way an organism and it’s immediate environment affect and respond to each other. 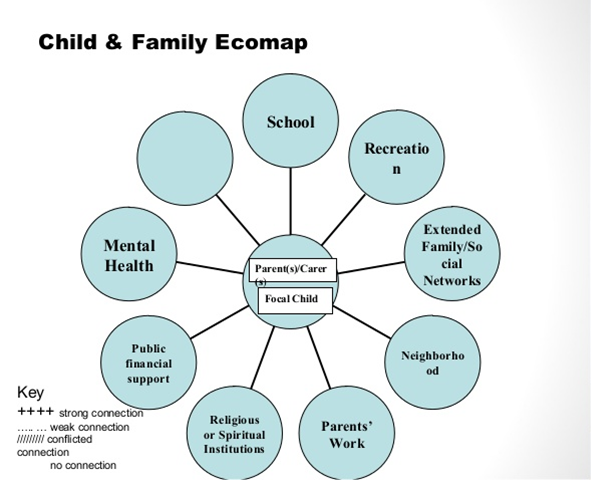 Bronfenbrenner’s ecological model (1979) provides a framework for understanding how critical factors in a child’s environment are inter-related. The ecological environment is conceived as a set of nested structures, each inside the next, like a set of Russian dolls. At the innermost level is the immediate setting containing the developing person. Pathways Ireland believes that this is best achieved using an ecological approach. This means the child is not viewed in isolation but rather it is acknowledged that he is part of many systems, each affecting him in different ways. It is therefore important to deliver a service individual to each child, for no two children are the same. In short ... it is essential to help young people and families identify natural helping networks in the community in which the child will reside. A social Network is a set of interconnected relationships among a group of people that provides enduring patterns of nurturance (in any or all forms) and provides contingent reinforcements for efforts to cope with life on a day to day basis. • Social riches are measured by: enduring, reciprocal, multi-faceted (having many aspects) relationships that emphasise playing working and loving. This framework establishes the individual as a developing person who plays an acting role in an ever-widening world. It is also important to afford young people the opportunity to explore life and peer relationships, with guidance, support and advice. 4. 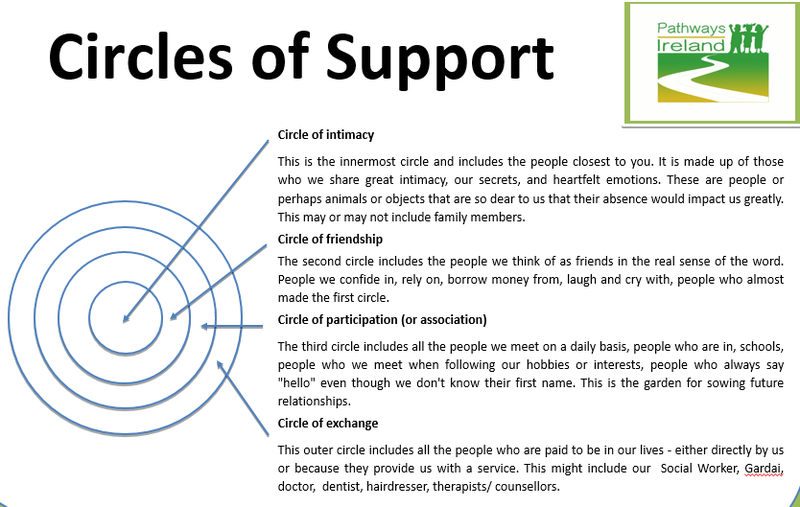 Identification of how the social support network functions with other interacting systems (e.g. school). 6. Identification of health promotion versus health hindering forces in the relationships (e.g. use of alcohol). 8. Engagement of the family support network in the intervention plan. Demonstrating the importance of social networks in supporting the development of children and families.